HELICOPTER ACTIVITY AROUND THE AREA - WHAT IS GOING ON? (64801/64804) — Joplin News First confirmed early in the evening that area police departments were working with a helicopter of the Missouri State Highway Patrol. Better weather this past week has shown a rise in dangerous motorcycle speeding/tricks/pursuits across the entire area. Joplin News First heard earlier in the week, firsthand of a Newton County chase where a bike evading police reached speeds up to 130 mph. Thank you to our area police depts and the Missouri State Highway Patrol for keeping us all a little more safe tonight. And for keeping some motorcycle riders safe from themselves. We believe the last helicopter has landed. The image you see is from a FREE app called FLIGHT AWARE. Get it in the GOOGLE PLAY STORE or the APP STORE. Gardner Express Care, 1701 West 26th. • Need a Doctor for your Primary Care? (64801) -- This home is located in Duquesne so the responding fire department Duenweg Fire Department made quick work on this windy afternoon. You can see some of the firefighters in our LIVE! video responded without all their fire gear. It’s always good to have back up on the way but these brave and devoted firemen didn’t slow down. Mutual aid was requested from the Joplin Fire Department and the Redings Mill Fire Protection District. Mutual aid is an agreement where city to city they share services and help to support one another. This is even done across state lines in our area. The address is 920 Walnut Ridge in Duquesne. The neighborhood is just a few blocks south of East 7th Street near Dollar General and Mason Woodard. 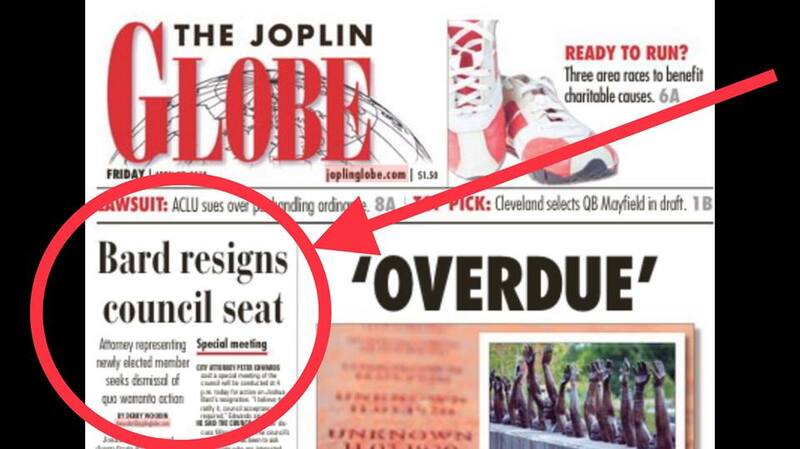 Thank you to Debs, Tara and Cathy for spotting what was happening and letting know, today you are Joplin News First. • Start your collection or restart it! (64801) – The Joplin History & Mineral Museum have had model trains on permanent display for decades. Without the trains Joplin never would have existed when the mining boom hit 125 years ago. This is a fundraiser for the Joplin Museum Complex so there is a small admission fee ($3) but bring kids and grandkids free (12 & under) with an adult. “[This is a] great time to start a Model Railroad Hobby or purchase items for your layout! Of course you can come and just brows the layouts! Tickets available at door.“ The Tristatemodelrailroaders state on the event page. Today at Schifferdecker Park at the Museum Complex. Where you can reignite your childhood love of trains and watch the twinkle begin in another! (64801) – Ignite your love of trains as you witness the most amazing scenescapes and model trains on display at the Joplin Museum Complex. The Joplin History & Mineral Museum have had model trains on permanent display for decades. Without the trains Joplin never would have existed when the mining boom hit 125 years ago. Today at Schifferdecker Park at the Museum Complex. Where you can reignite your childhood love of trains and watch the twinkle begin in another! 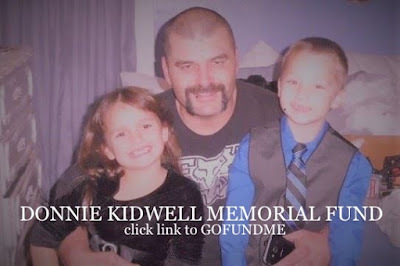 (64804/64801) -- Joplin News First good friends Ron & Carlen Baptista told us how truly wonderful Donnie was as a dad and a friend. "He was ALWAYS there for his friends," Carlen told us. "When we would meet up he was always at his kids games or events...he loved his family." (64801) – Ignite your love of trains as you witness the most amazing model trains on display at the Joplin Museum Complex. “[This is a] great time to start a Model Railroad Hobby or purchase items for your layout! Of course you can come and just brows the layouts also! Tickets available at door.“ The TriStateModelRailroaders state on the event page. The Joplin History & Mineral Museum have had model trains on permanent display for decades. And this train show is part of their annual sharing with the community - that love of trains and model trains. It’s been an ongoing love 20 years now. • We asked why is JPD investigating this crash instead of Missouri State Highway Patrol? "Mr. Rohr is a private citizen who is no longer employed by the city of Joplin." (64801) -- Official information from the Joplin Police Departmentregarding the motorcycle fatality last night on West 7th and Tri-State Road. The crash involved a Ninja Motorcycle and a white SUV. Donald Kidwell III of Galena, KS was operating the motorcycle. He was transported to an area hospital where he later died of his injuries. The driver of the white SUV was 58 year old, Mark Rohr. Rohr is Joplin's former city manager who left his position with the city in February 2014. Tuesday evening, at 8:54pm, the Joplin Police Department responded to a two-vehicle crash at 7 th and Tri State. A 2016 Dodge Durango, driven by Mark Rohr, 58, Joplin, was turning east from the stop sign at 7th and Tri State Road. A 2005 Kawasaki Ninja was being operated westbound on 7th by Donald L. Kidwell III, 38, Galena, Kansas. The motorcycle impacted the rear driver’s side of the SUV. Kidwell was ejected from the motorcycle. Kidwell was transported to Mercy Hospital where he died from his injuries. Rohr wasn’t injured in the crash. The Joplin Police Department Major Crash Team responded and is investigating. This the 5th fatality crash of 2018 for the Joplin Police Department. For LIVE! Breaking news as it happens...Joplin News First. (64801) — Capt Trevor Duncan of the Joplin Police Department confirm to Joplin News First at 10:42 pm. "It is now a fatal crash. Nothing else released until tomorrow." Avoid this area of West 7th St/Route 66. MoDOT Southwest Missouri has set up a road block at Black Cat Road to the West. And also at 7th and Schifferdecker to the East. Alternate routes will be Belle Center Road to the North or 13th/Junge to the South. Thank you to our first responders tonight. Carl Junction Fire Protection District, Joplin Fire Department and officers including Joplin Police Department, Jasper County Sheriff's Office, Missouri State Highway Patrol. Also Rosenburg Recovery & Towing for your work. 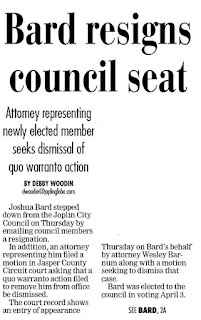 (64801) – Jasper County Prosecuting Attorney Theresa Kenny tells Joplin News First that she is preparing to file a 'quo warranto' in the matter of Joshua Bard holding a seat on the Joplin City Council. 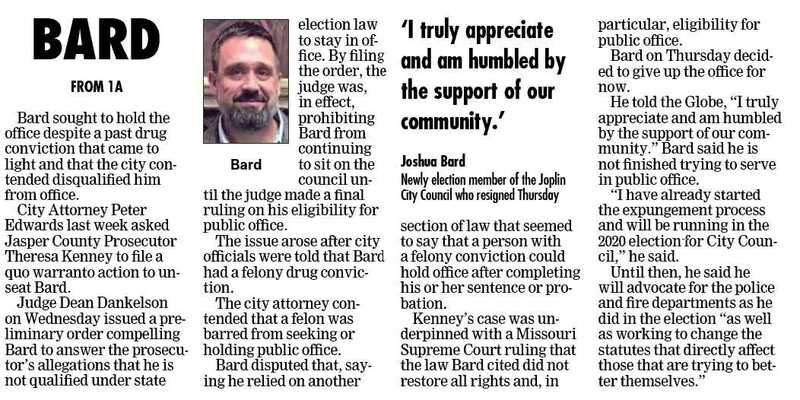 After Bard was recently elected to one of the 3 general seats on the Joplin City Council, Joplin city attorney Peter Edwards, brought to light that Mr. Bard had a past criminal record which wouldn't allow him to serve on the council. After Bard challenged that decision saying he has been off probation for 6 years, last Friday Edwards turned it over to the Jasper County Prosecuting Attorney, Theresa Kenny. The quo warranto will be filed in Joplin since it's the closest jurisdiction. And a hearing must be held within 3 to 20 days. The prosecuting attorney will present the law they feel that doesn't allow Mr Bard to serve in office. And then Mr. Bard as the respondent and have a chance to show why he should remain in office. Then a judge will decide if Mr. Bard has the right to serve. It's not known what Jasper County judge would hear the case – if it's even picked up. They go by a rotation of numbers on case and judge assignments. If it's not even chosen to be heard by a judge then by that silence of the court Mr. Bard would be determined ineligible to serve. 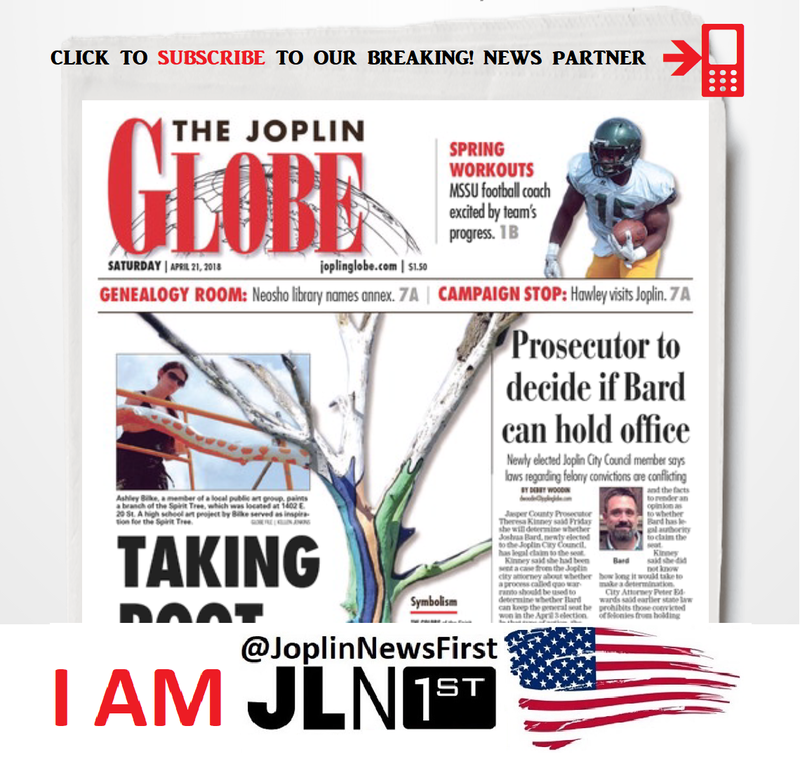 “I feel that when my right to vote was reinstated January 1, 2012, then also my right to hold an office should be reinstated too,” Bard tells Joplin News First. (64801) — A call came in to Joplin Police Department there was a male subject ‘threatening people with a taser’ at a residence in the Southern part of Royal Heights along Turkey Creek. Capt Trevor Duncan confirms with Joplin News First they set up a perimeter (seen in map). And at the same time tips were pouring in on our FB, tipline and messenger. When officers responded to the residence he fled into the wooded area. K9 were brought in and the subject was apprehended quickly. He was wanted on some outstanding warrants police also confirm today. Developing story we will update you as more information becomes available. Thanks also to our friend Elisabeth who called us from the Trolley when she saw JPD swarming into the Royal Heights area and let us know - today she is Joplin News First. (64801) — Joplin Police Department confirm tonight they came upon a stolen vehicle and then realized the occupant wasn't the owner. The occupant drove through a neighborhood and ducked into this dead end alley (seen in images). From there he fled on foot. Before K9 arrived JPD blocked off areas of Jackson and Conner. One neighbor said the man on foot offered $5 to a person for a shirt to change up his identity. He was finally taken into custody about 6 blocks away. Changing the shirt didn't stop the K9 from identifying him. "You should have seen it, they said K9 is out, or something like that, and off he went," one neighbor told us. She was glad to hear us tell her the suspect was in custody at 4th and Byers near the corner store. Thank you JPD for your quick work. More official details as they become available. Thanks for the calls/texts/messages from Joey, Shelly, Colton, Phillip, Jenny and so many others. Tonight thanks for telling us what you saw because you are all Joplin News First! (64804/64801) -- Joshua Bard received 80% YES - he should serve - on our little straw poll over the weekend. On Sunday he told Joplin News First, "The amount of support is absolutely heartwarming!" 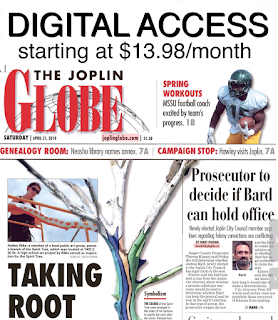 Bard ran for one of 3 general election seats on the Joplin City Council and won. 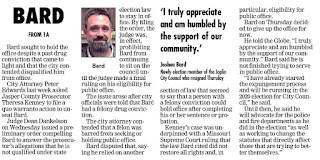 However it wasn't until after the election that Joplin City Attorney, Peter Edwards, brought Bard's past misdeeds to light noting, state law prohibits those convicted of felonies from holding public office. And he cited section 115.306 of Missouri law. Bard in turn has noted section 561.021 of Missouri law, "A person convicted of a felony...forfeits any office he may then hold, and is ineligible to hold office until completion of his sentence or probation." Bard completed his 5 year probation January 1, 2012, that was 6+ years ago. "Court records show that Bard, 44, pleaded guilty June 2, 2006, to a charge of manufacturing a controlled substance and was placed on supervised probation for five years by Judge Timothy Perigo in Newton County Circuit Court. Friday it was determined that Jasper County Prosecuting Attorney, Theresa Kenny, will decide if Bard is eligible to serve. And in peeling back the onion further he did resign - however the resignation was rescinded by Bard. But it was not presented and accepted in a council meeting yet. 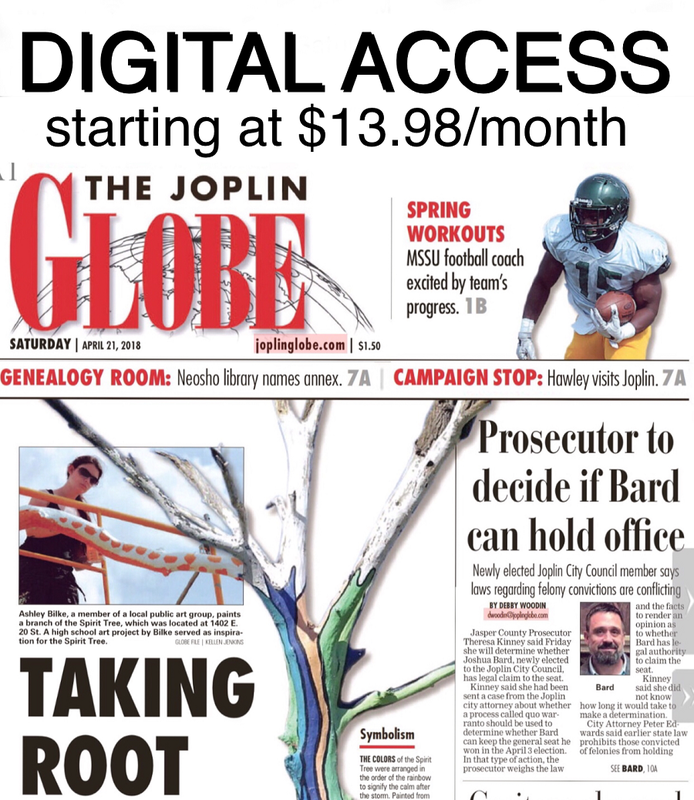 It's not known when Kenny will make a decision but Bard told Joplin News First yesterday. "We have an opportunity to step and make the change we desire as a community. I may get bad news this week. But I will not be defeated. Your support, kind words and generosity have given me a huge amount of faith in our community." Our LIVE! BREAKING news is sponsored by Gardner Express Care, 1701 West 26th. TopHat Flatbead Trailer, double axle, wood deck. Right fender repair damage from hitting a deer. Note a modified lip on the rear edge where ramps can connect. Also oil stains on the wood deck. April 7, 10:00 pm, from area near Heartland Pet on Hwy FF. Black Toyota Tundra, black bed cover and black wheels and two males. JOPLIN AREA STOLEN ITEMS is a Community Action Group sponsored by Joplin News First and Gardner Express Care. "The amount of support is absolutely heartwarming! In church today at CCUMC. Sloan spoke of the story about David and Goliath. It was exactly the story I needed to hear at this very moment in my life. This verse is a perfect reminder of what we have before us. Ephesians 4: 29 Do not let any unwholesome talk come out of your mouths, but only what is helpful for building others up according to their needs, that it may benefit those who listen. We have an opportunity to step and make the change we desire as a community. I may get bad news this week. But I will not be defeated. I still have the opportunity if there was a mistake made, and come back stronger than before. (64801) — There are more questions than answers this morning. Joplin News First confirm with Joplin Police Department this crash apparently didn’t have a driver or occupant when they arrived on the scene. It is not know at this time if this is a stolen vehicle or if the driver and/occupant(s) were injured. Our LIVE! and BREAKING NEWS is brought to you in part by Gardner Express Care. Located at 1701 West 26th. 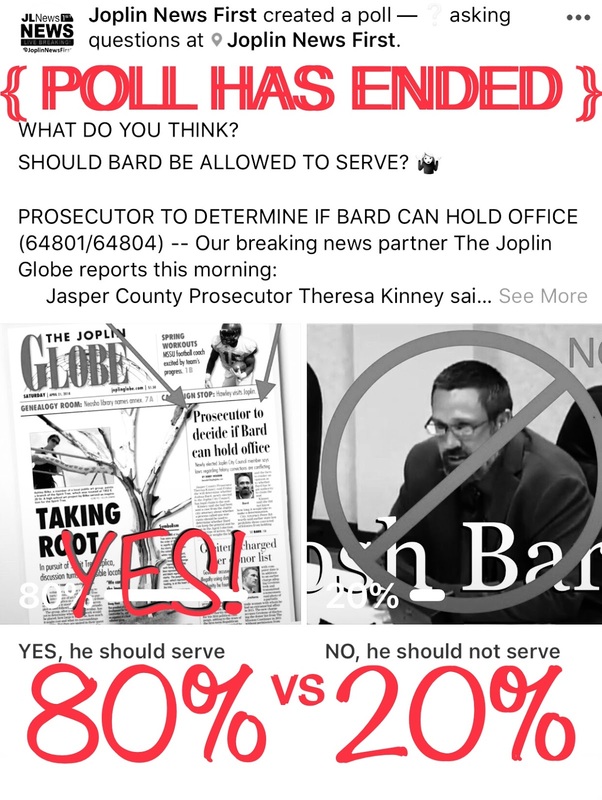 (64804/64801) -- Josh Bard received 80% YES - he should serve - on our poll over the weekend. On Sunday he told Joplin News First, "The amount of support is absolutely heartwarming!" WHAT DO YOU THINK? 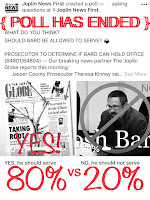 SHOULD BARD BE ALLOWED TO SERVE - VOTE! Jasper County Prosecutor Theresa Kinney said Friday she will determine whether Joshua Bard, newly-elected to the Joplin City Council, has legal claim to the seat. 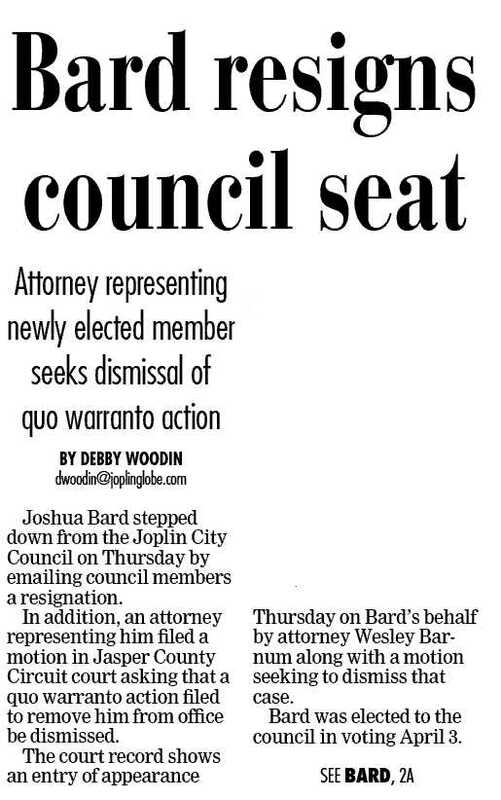 Joshua Bard resigned the council seat on Wednesday, but withdrew his resignation on Thursday morning, saying he made a hasty decision when the city attorney spoke to him about the city's position on his eligibility to hold the council seat. City Attorney Peter Edwards said earlier state law prohibits those convicted of felonies from holding public office. He cited section 115.306 of Missouri law. (64801) – Joplin High School Theater Dept performing a section of their upcoming production, The Adams Family at Third Thursday. "The Addams Family" runs May 3, 4 & 5. 7:00 pm nightly at Joplin High School's Coulter Auditorium. Come and see the hard work done by the actors and crew! ~Third Thursday is sponsored by our friends at KODE/KSN and they are kicking off their YOUR TOWN tour. They are looking for a KIDCASTER / CORRESPONDENT and kids can audition. Ages 6th -11th grade. ~This month you can see a POP UP SKATE PARK set up sponsored by Kerosene Skate Shop near Blue Moon Boutique. ~Aaron Sachs & Associates, P.C. are giving away bike helmets to kids. ~Abernathy Roofing and Construction is a sponsor giving away cotton candy. 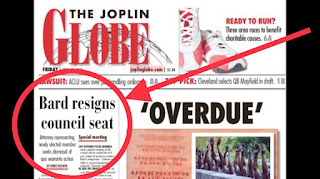 (64801/64804) -- Historically when an elected council member has resigned the Joplin City Council takes applications to consider filling that spot. However that is not confirmed at this time. In the City Charter, section 2.05. Council appoints, and it can be anyone who meets the qualifications. The appointee serves until the next election (2020). First, I want to say thank you to everyone who has supported me over these last several months. To many of you, it is no surprise that I have a past, a past that I'm not necessarily proud of at all. But we cannot allow ourselves to be defined by what we have done. I had hoped and still hope to use that example in my life. With that being said, I have resigned my position as a member of our Joplin City Council. In all the research I had done prior to running. I missed a MO Statute that prevents me from holding office. (64801/64804) — “Seems extreme to block traffic for so long to cripple morning traffic. Let's hope the ambulance crews are aware?” This was a text from a Joplin News First tipster. Joplin Police Department do not have any information. Is it a maintenance issue? What is going on Kansas City Southern, Joplin would like to know, thanks! (64804) – Traffic diversions and closings tonight should be back to normal by morning. So many other procedures they can do to save you money! (64804) — Work continues on the Connecticut Ave bridge and the Westbound I-44 lanes are closed tonight. Gardner Express Care -- 1701 West 26th. • DOT Physicals • Drug Screenings • Dozens more procedures, ask them! [EXPIRED] Gas line repair finished! (64804) — About 6:00 this evening a tipster let us know about a possible gas leak on East 32nd, just East of Rangeline. The project is going to take hours to repair. An unnamed work crew had mistakenly hit a ‘significant’ gas line. No one was injured and the area was not evacuated. The public is not in danger. Joplin Fire Department are on the task this evening of narrowing East 32nd to just two lanes as all Westbound lanes are closed. Thanks to JFD and Spire for responding this evening. Our LIVE! and BREAKING NEWS is brought to you in part by Gardner Express Care @ 1701 West 26th. We need your help finding him. He is homeless, has no known vehicles, and no known employment. You can contact us with information: Detective Morrison via email at mmorriso@joplinmo.org or 417-623-3131 extension 627. If located call 911. Should be considered armed and dangerous, do not approach call us - or call 911. (64804) – [TEXT DIRECTLY FROM WIKIPEDIA] On March 22, 1933, Buck Barrow was granted a full pardon and released from prison. Within days, he and his wife Blanche had set up housekeeping with Clyde, Bonnie and Jones in a temporary hideout at 3347 1/2 Oakridge Drive in Joplin, Missouri. According to family sources, Buck and Blanche were there to visit; they attempted to persuade Clyde to surrender to law enforcement. Bonnie and Clyde's next brush with the law arose from their generally suspicious—and conspicuous—behavior, not because they had been identified. The group ran loud, alcohol-fueled card games late into the night in the quiet neighborhood. "We bought a case of beer a day," Blanche would later recall. The men came and went noisily at all hours, and Clyde discharged a BAR (Browning Automatic Rifle) in the apartment while cleaning it. No neighbors went to the house, but one reported suspicions to the Joplin Police Department. The lawmen assembled a five-man force in two cars on April 13 to confront what they suspected were bootleggers living in the garage apartment. Though taken by surprise, Clyde was noted for remaining cool under fire. He, Jones, and Buck quickly killed Detective McGinnis and fatally wounded Constable Harryman. During the escape from the apartment, Parker laid down covering fire with her BAR, forcing Highway Patrol Sergeant G. B. Kahler to duck behind a large oak tree while .30 caliber bullets struck the other side, forcing wood splinters into the sergeant's face. Parker got into the car with the others. They slowed enough to pull in Blanche Barrow from the street, where she was pursuing her dog Snow Ball. The surviving officers later testified that their side had fired only fourteen rounds in the conflict, but one hit Jones on the side, one struck Clyde and was deflected by his suitcoat button, and one grazed Buck after ricocheting off a wall. The group escaped the police at Joplin, but left behind most of their possessions at the apartment: items included Buck and Blanche's marriage license, Buck's parole papers (three weeks old), a large arsenal of weapons, a handwritten poem by Bonnie, and a camera with several rolls of undeveloped film. Joplin News First does not claim ownership of any images contained in this video/post. No profit is generated for this story. These images are available for public viewing on numerous websites. If you claim ownership and would like credit or have the photo(s) be removed please PM admin. Today we have learned, “One residence on South Rex was damaged due to numerous bullets hitting the residence. There were no injuries or arrests,” Capt Trevor Duncan tells Joplin News First. “The residence was struck by approximately 8 rounds.” It's unknown if the specific residence that was hit was the target. Also it’s not known if the rounds were discharged from a vehicle or someone was on foot. Joplin Police Department are not revealing the caliber of bullets recovered at the scene. If you have information please contact the Joplin Police Department 24 hours a day and talk with an officer 417-623-3131. “13th and Rex blocked off, 12th and Rex blocked off, 11th and Rex blocked off. Officers doing intense ground search, and weapons out. Looking in driveways, streets, yards, trees,” one tipster told Joplin News First. Upon Joplin News First arrival near 10th and Peters Ave, Joplin Police Department advised us to stay away from the immediate area for safety. Scene was cleared however officers remained to begin an investigation. Thank you to Mandi, Chris, Margaret and Keith for telling us what you were seeing on our tipline and FB messenger. You are Joplin News First tonight. ABOUT TYLER ANDERSON: Growing up in the Ozarks in Springfield then into college joined the Marines. He is a former Marine. He is a federally licensed machine gun dealer and that allows him to own these highly restricted firearms. Some of these weapons are not available to the average gun owner. However he can operate them and you can too - under his supervision - at his range OzarkMG in Lebanon. (64804) -- "This is a very difficult time for his wife, Kathy, and their son, Adam. Mike leaves a lot of friends behind. Adam [Mike & Kathy's son] is getting married in a few short weeks," according to a private message received at Joplin News First. Joplin News First reported live from the fire on Friday evening. The preliminary cause is determined to be a lightning strike. In a statement from the Joplin Fire Department, “55 year old Michael Blood was transported to Freeman West and later to a burn unit in Springfield where overnight he succumbed to his injuries." From information gathered on Joplin News First posts and private messages, Mike Blood was a 1980 graduate of Parkwood High School. He and his wife, Kathy, own and operate Blood Tax Service, located at 2901 South Main. Mike's father, Vern Blood, is a retired tax preparer as well. Thank you to the Joplin Police Department, Chief Jim Furgerson and his Joplin Fire Department and Joplin Professional Firefighters L59 for your work, heart and compassion. Our deepest condolences to the family. 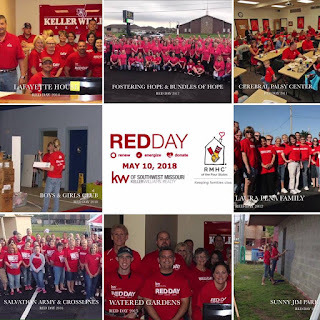 (64801) -- Keller Williams Realty of SWMO each year choose a cause to support together on one day, they call it #REDDay. They are in the community making a difference. This year they have chosen Ronald McDonald House Charities of the Four States! Thank you KW!